The Internship program is centered around the idea of "Civic Engagement through Philanthropy and Education", and includes brainstorming community project ideas and bringing those projects to life. This is done through a variety of initiatives. The Chair of the Mayoral Internship Program for 2018-2019 is Edwin Ong. The Digital Platform is a Mayoral Internship project seeking to utilize the Internet in the twenty-first century to aid the various missions of the Pathway Foundation. This is accomplished through the use of the Internet to supply information about and broadcast the activities of the Pathway Foundation. The Media and Blog Project helps raise awareness through working with other projects as well as Pathway Foundation and blogging/designing content. This project also uses the Bellevue Mayoral Internship website and social media to document events from both the internship and PATH in order to do outreach and build partnerships with other individuals and organizations. The American Creed Project seeks to promote American Creed values within the Asian American community. This is done through a two-step process: translating relevant materials discussing the American Creed into Chinese and having discussion forums with Chinese Americans and Chinese immigrants. We are working with organizations such as NWCS and Aurorae Young Learning to bring discussions about relevant American issues to all Chinese Americans in the Eastside area. PATH is an international health organization driving transformative innovation to save lives and improve health worldwide. PATH aims to promote the health of people globally through advancing technologies, strengthening systems, and encouraging healthy behaviors. 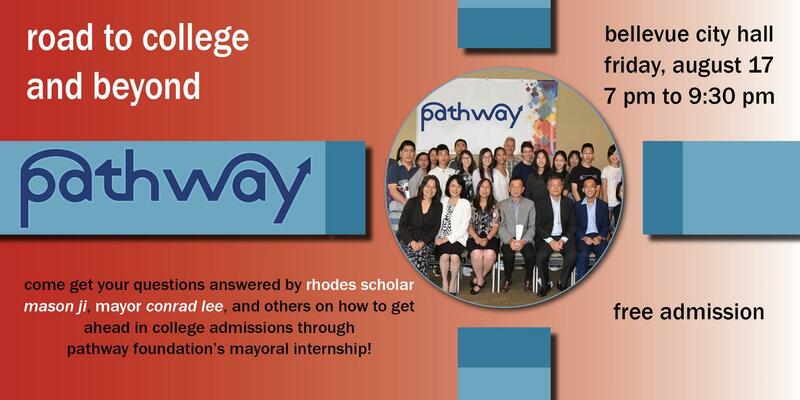 Pathway Foundation has partnered with PATH to form the PATH Youth Ambassador Program. Led by two Mayoral Interns, the Youth Ambassador Program strives to increase awareness of and civic engagement with PATH. Founded and directed by Bellevue Council member and Mayor Conrad Lee, American Immigration Forums is both an opportunity for students to engage in a topic of impact and further their community involvement and an effort towards achieving a wholesome society in engaging the public in an immigration-based dialogue. Learn more about American Immigration Forums here. During 2015, Kathleen Chen lead the American Immigration Forums to speak at the Bellevue City Council.